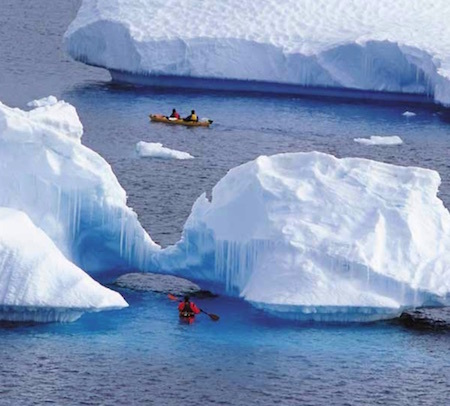 The experience of kayaking in the humbling wilderness of Antarctica is guaranteed to stir your soul. Paddle between brash ice and icebergs of all shapes and sizes, skim past penguin rookeries and seals sleeping on passing ice floes, or drift quietly as you watch wildlife unobtrusively, absorbing the majestic scenery that is Antarctica. 'Getting out amongst it' is Aurora's philosophy, and that is exactly what it does. Once your ship reaches the peninsula, the aim is to kayak at least once a day, weather depending. If the opportunity arises, you may go out twice, as the 24-hour daylight allows for some beautiful evening paddles under the midnight sun. Rather than travelling large distances, Aurora's aim is to see as much as we possible. You can paddle anywhere between 5 to 15 kilometres (2 to 4 hours) per outing, sometimes taking a snack and a flask of hot chocolate to enjoy on our excursion. Each group of 4 to 12 kayakers generally visit the same wildlife sites as your fellow expeditioners, however the smaller craft often means that you also have the opportunity to access areas that are often not accessible by Zodiacs. Aurora will also make time to do some shore landings with the rest of the group. When you visit Antarctica, the elements play an important role. It is important that you have an adventurous attitude and understand that our kayaking time will be effected by the weather that your ship experiences. If you have intermediate paddling experience and would like to take part in Aurora's sea kayaking option on your voyage please return the Sea Kayaking Activity Form at time of booking. Aurora's kayaking guide will review your form for suitability and experience before approving your place in the kayaking group. Why travel with Aurora Expeditions? At sea, Aurora Expeditions' high-latitude, expedition ship is small enough to go where others can't, often resulting in more landings. On land, Aurora's group size is limited to 16. Fewer people means a more personalised experience and a lasting camaraderie. Rather than book you onto another company's trip, Aurora Expeditions operate only its own expeditions, either on vessels that it charters, or working closely with local experts who share its ethos and style. Your security, wellbeing and understanding of the places you visit are Aurora Expeditions' staff's priorities. Aurora's staff have a passion for sharing their knowledge and making everyone feel as if they are on the same team. The more Aurora Expeditions' remote area specialists share their knowledge about the history and natural environments you encounter, the more rewarding the experience. Aurora Expeditions' helped develop international environmental guidelines for the polar regions you visit, and consciously limits the number of people it takes to its destinations. Aurora Expeditions stops for breaching whales! Enjoy your destinations in your own way, within the bounds of safety. Hike up a snow slope, take your time photographing wildlife, inspect historical huts or simply sit and admire the view. Aurora Expeditions' spirit of adventure! Photograph wind-plumes on Mt Everest, share the trail with gauchos, yak-herders or rarely-visited rainforest hunters. Scuba dive or snorkel with leopard seals, sea kayak with whales or enjoy a feast of tundra berries. Ponder ancient rock paintings or lift your spirits in a Buddhist monastery. No matter where in the world, Aurora Expeditions encourages a true sense of exploration. Aurora Expeditions loves what it does and believes that everyone involved, from expeditioners to staff, ship's crews to trekking teams, shares the same goal – the best expedition imaginable! Whether it's a stylish jacket and photo journal memento to keep, or gumboots to wear on our polar voyages; flights for our fly/sail Antarctic program; linking flights in Iceland, Alaska, Ecuador, Nepal and Africa or Everest heliflights, our inclusions are what most others would consider extras. From Aurora's very first Antarctic voyage in 1992, it has been committed to environmentally responsible tourism practices. Founding Australian members of the International Association of Antarctic Tour Operators (IAATO) and the Association of Arctic Expedition Cruise Operators (AECO), Aurora supports research, donates funds, and allocates resources to ensure it leaves places it visits as it found them – or better. As you travel with Aurora,it hopes you develop a deeper understanding of the natural forces shaping our world. By creating lifelong environmental ambassadors, Aurora aims to preserve the wild places for future generations. If you're a solo traveller, welcome on board! Aurora Expeditions welcomes many solo travellers on its trips, and their numbers are increasing each year. Maybe it's simply the nature of the expeditions, but Aurora understands what a big step it is for many to set off on their own. To address this, Aurora has developed its informal 'cabin-mate finding service' that matches solo travellers with a cabin mate of the same gender. And it has had great success so far! Aurora Expeditions' small groups and relaxed atmosphere make it easy to make new friends (and remember everyone's name! ), and the inspiring destinations are a great conversation starter. Plus, by sharing a cabin you'll also avoid paying any extra 'single supplements'. You might arrive alone, but Aurora can guarantee that you'll o home with lifelong friends. People who ordered Antarctica Activity Guide also ordered the free travel brochures below. Click on the images to find out more about these brochures.